We’re so used to seeing Jake Gyllenhaal play the good guy. The hardworking detective in Prisoners, the loveable stud in Love & Other Drugs, and of course Jack in Brokeback Mountain (excuse me while I cry myself to sleep). It’s a change then to see Gyllenhaal play his creepiest character yet, in a film where he reportedly only blinks four times. From Jack Twist to Jack the Ripper? 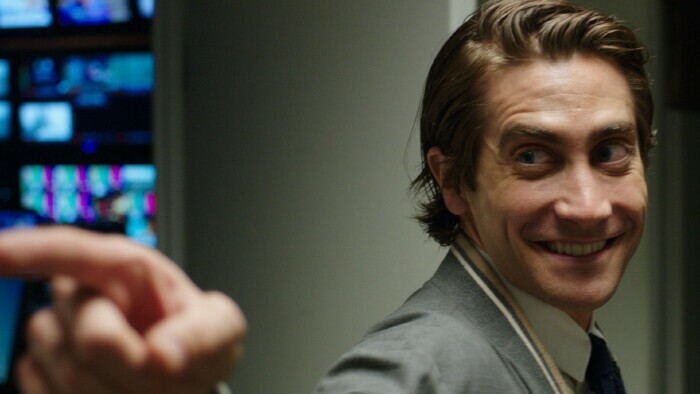 In Nightcrawler, Louis Bloom (Gyllenhaal) is desperate for a job. Stumbling across a crime scene one night, he decides to pursue work as a videographer in the area of crime journalism. He is relentless in this pursuit, breaking all boundaries to get the perfect footage. 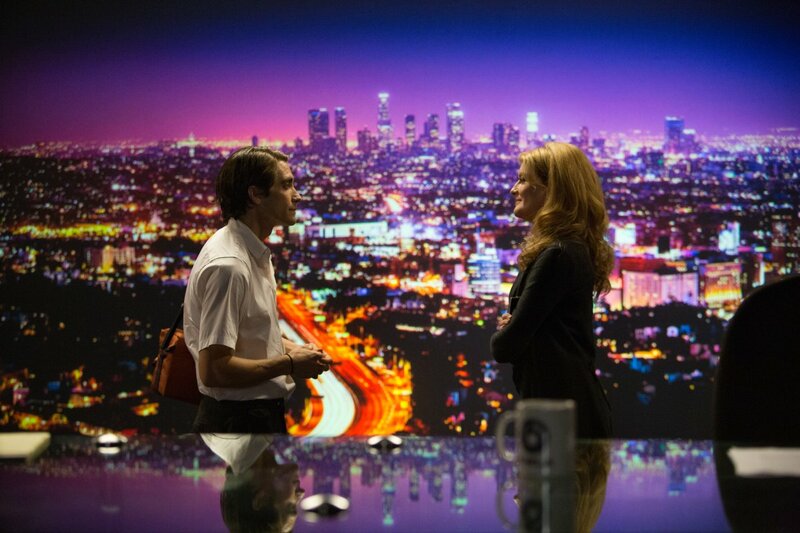 He finds a buyer in news director Nina Romina (Rene Russo) and an easily manipulated assistant in Rick (Riz Ahmed). 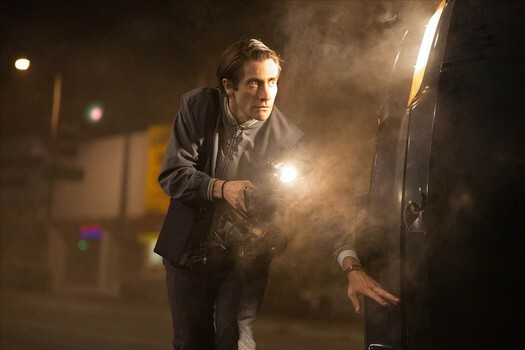 Nightcrawler works as an interesting commentary on journalistic integrity, but is (hopefully) so far-fetched that it becomes satire. The desperation of not only Louis, but also Nina, and countless others to break the big story at all costs, without a hint of consideration for the victims, is astounding. However, it’s all a bit easier to believe in the current economic climate where job security can be a rarity. Writer and director Dan Gilroy in his directorial debut has certainly given us some interesting themes to chew over here, but his main man could have been further developed. Louis Bloom is an unsettling character. With no back story to speak of, he first appears as potentially adorkable, but bordering on psychopathic. He flashes that Jake Gyllenhaal smile but for once, female audience members may not feel the urge to jump him. He looks dead behind the eyes and he has the air of a desperate teenager ready to shoot up his high school. He says things like “I like the way you smell” to a woman he barely knows, and you almost expect him to turn into Hannibal Lecter at any given moment. Though perhaps he is more reminiscent of American Psycho’s Patrick Bateman, except that instead of a chainsaw he wields a video camera. Unfortunately he never quite reaches the heights of these characters and we are left wanting for an understanding of how he has ever reached this point. Jake Gyllenhaal puts in a stellar performance as Louis. There’s no hint of a twinkle in his eye here, but rather black pools of nothingness. Gyllenhaal embodies Louis whole-heartedly. He’s almost unrecognisable due to his gaunt physique following an intense weight loss regime prior to filming where he reportedly worked out eight hours a day. That dedication rivals that of his character, though let’s hope in a less psychopathic way. Rene Russo and Riz Ahmed put in solid supporting performances, but it’s all about The Jake here. Gilroy captures that dirty LA nightlife vibe well, with the opening and closing shots in particular showcasing the eerie beauty of a city based on contrived appearances. James Newton Howard’s score is effective, with some sections even seeming to bear resemblances to television news themes. Though the film’s pacing feels slow in parts, Gilroy manages to build tension, but not heart-racingly so. 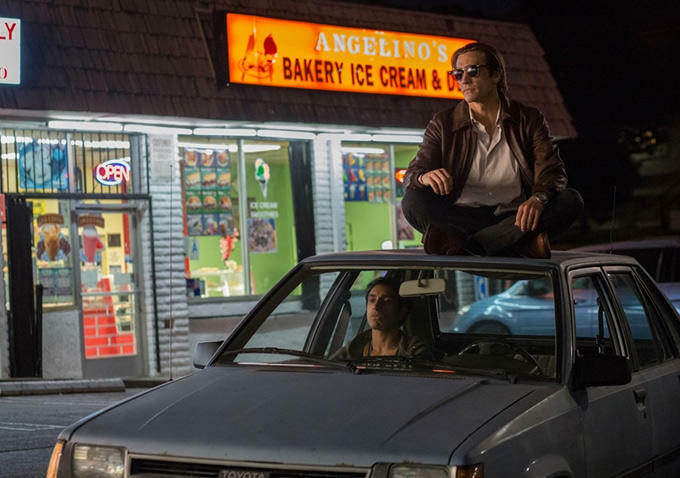 Nightcrawler is a quality film, but it doesn’t feel rave-worthy. This could perhaps be attributed to the lack of a backstory for an antihero who never quite packs that truly terrifying punch to create genuine awe. 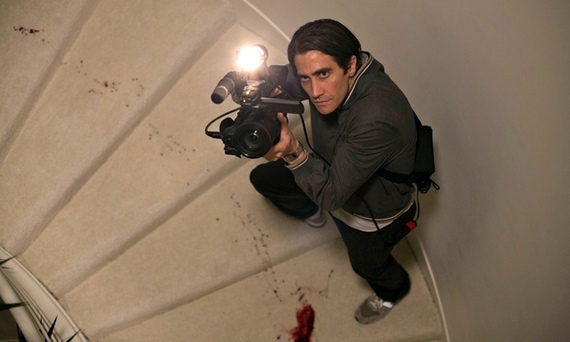 Gyllenhaal’s performance is award-worthy but Louis Bloom remains a frustrating mystery. Good review Claire. Thanks to Gyllenhaal, this movie is truly a creep-show, albeit a very interesting and relevant one at that.